Bleona Qereti photo with Franco Nero: "Italians do it better"
Bleona Qereti is one of the Albanian artists known also in Hollywood. 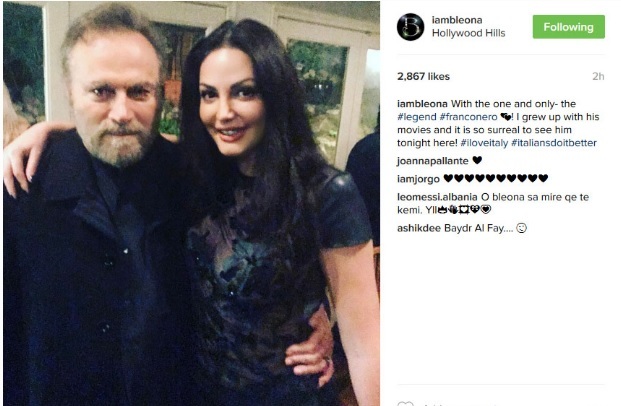 This time the Albanian singer posted on Instagram a photo during an evening with VIP persons, where she appears with the Italian well known actor Franco Nero, who kissis Bleona on the cheek. "I grew up with the movies of this person and I do not believe that I am standing with reality. "Italians do it better...," she wrote in an inscription on one of the pictures published. Bleona has certainly been talking about the actor's films, implying that according to her, the Italians are very good actors.